Everest base camp trek is one of the most popular trekking trail of Nepal. It is one of the outstanding destinations for adventure seeking trekkers which offers the best opportunity to gain the Himalayan experience. It is the route which guide to base camp of the world’s highest mountain i.e. Everest.The trial goes along the course of the Dudh Koshi River. Our journey begins from Lukla (Flight to Lukla)to the base camp through the heartland of the Sherpa community. If the trekker had any health problem, there are good facilities of health services for trekkers at Khunde and Pheriche. Everest base camp trek is medium-hard class. This trek might be a trouble for some of the tourist because of its high altitude. You should be fit in order to have good experience of this trek. In this trail, You can experience high alpine countryside and Himalayan ranges like Mount Everest, Lhotse, Makalu which are more than eight thousands meter above sea level. One can see the clear view of Mount Everest after reaching Kalapathar(5550m). People belief that luck should also be in favor because the climate here is unpredictable. There can be a lot of flight cancelation and delay. It mean’s you should have flexible time to trek to Everest region. It can be quite strenuous at times as you have to walk for an average of six hours every day. However, the presence of tea houses along the route gives us time for refreshments and rest. The following itinerary is one of the reccommended but it can be minimize as well as prolong as your wish. We can arrange the trips to begins on any date during the trekking season (March through May & September through December) in Nepal according to your time frame. Arrival in Kathmandu - You will be warm welcomed at airport by NEAT Airport representative and then you will be transfer to hotel. Our tour advisor will meet you at your hotel and brief about your program. This day, you can have a rest at the hotel or enjoy the walk near by your hotel to get familiar with Nepalese life style and culture. Swayambhunath Stupa:You will first visit the Swayambunath Stupa (Monkey Temple). It is said that Swayambunath Stupa is more than 2,000 years old, and it symbolizes knowledge. The painted eyes on all four sides symbolize the all-seeing power of Buddha.It is situated to the west of the city on a hill which is 77 meters above the valley. Pashupatinath Temple:The sacred Hindu temple Pashupatinath is considered the holiest cremation ground, and people bath in the Bagmati River with a faith of cleansing themselves spiritually. Many Sadhus or Hindu Ascetics live here. During religious festivals, Hindus come to make offerings, and it get more then a million during festivals . Drive back to your hotel. Enjoy the evening at your own. Overnight at hotel. Flight to Lukla and trek to Phakding - (2652m) 3 hrs walk Early in the morning, you will be transferred to domestic airport for flight to Lukla which takes about 45 minutes. Your flight to Lukla will be memorable as it enables you to fly over beautiful mountains and hills. After reaching Lukla, you will have to trek to Phakding, a beautiful place with green landscape and view of Kusum Kangararu and overnight at guest house with dinner and breakfast. 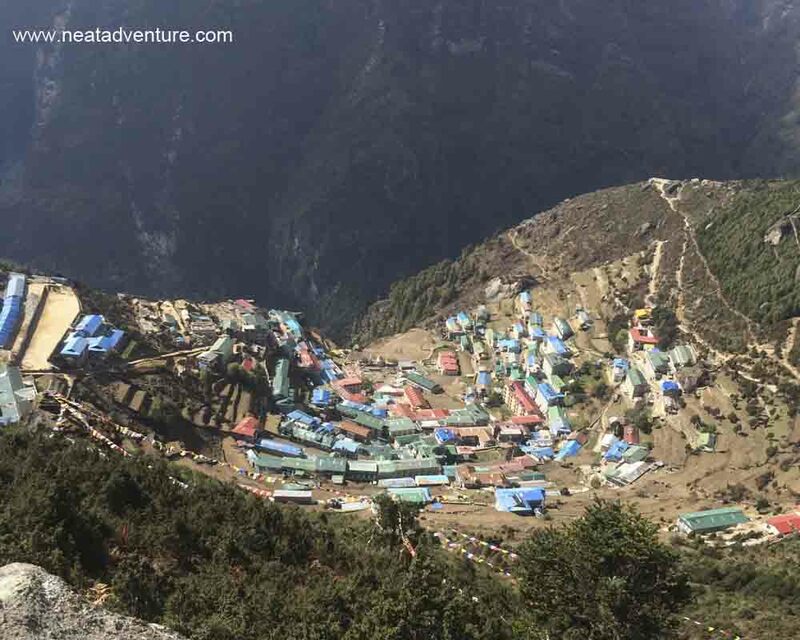 Phakding to Namche Bazaar - (3440m) 6 hrs walk We trek through Himalayan pine and deodar forest following the Dudh Koshi river to reach Namchebazaar. Namchebazaar was famous as trading center as it was Nepalese and Tibetan traders common ground for exchanging salt, dried meats, textile etc. You will spend two days exploring lives in this area, for shopping and acclimatization. Acclimatization in Namche Bazaar(optional) The climate here is so unpredictable and cold. After our breakfast, we will trek towards Khumjung. We have to go above Namchebazaar and pass through Syangboche. From the top of hill above Syangboche, you will get the clear view of world highest peak, Mount Everest(8848m), and other peaks like Tangboche peak (6367m), Lhotse (8414m), Amadablam (6856m) & many more others peaks. We will start next trek after having lunch at Khimde. After having good time here, we will get back to Namche. Overnight at guest house inclusive of full board meals. Trek Namche Bazaar to Tengboche/Deboche - (3860m) 5 hrs walk It is easy to get to Tengboche as the track is flat. Then, we have to climb for Tengboche monastery, known as the spiritual centre of Khumbu. From here we can see awesome view of Mt. Everest, Mt. 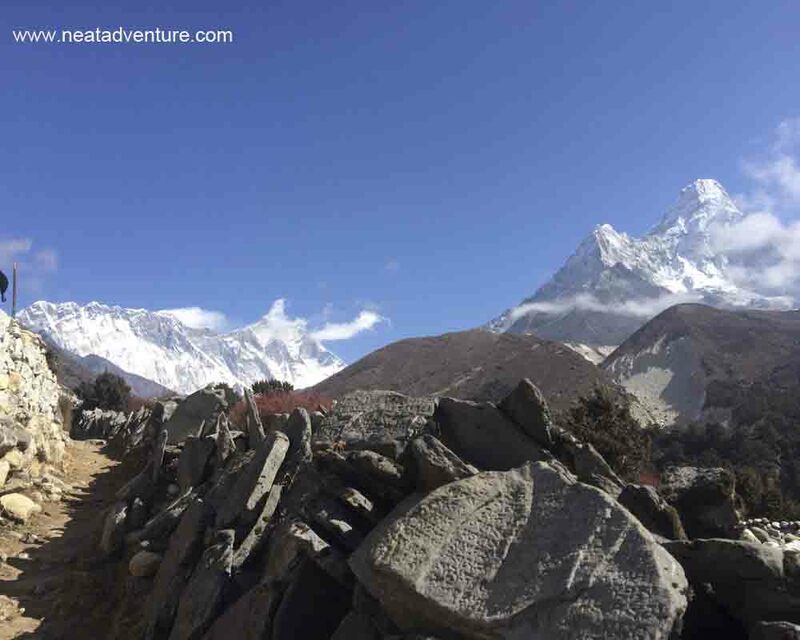 Amadablam on a clear day and other peaks. Over night at guest house including dinner and breakfast. 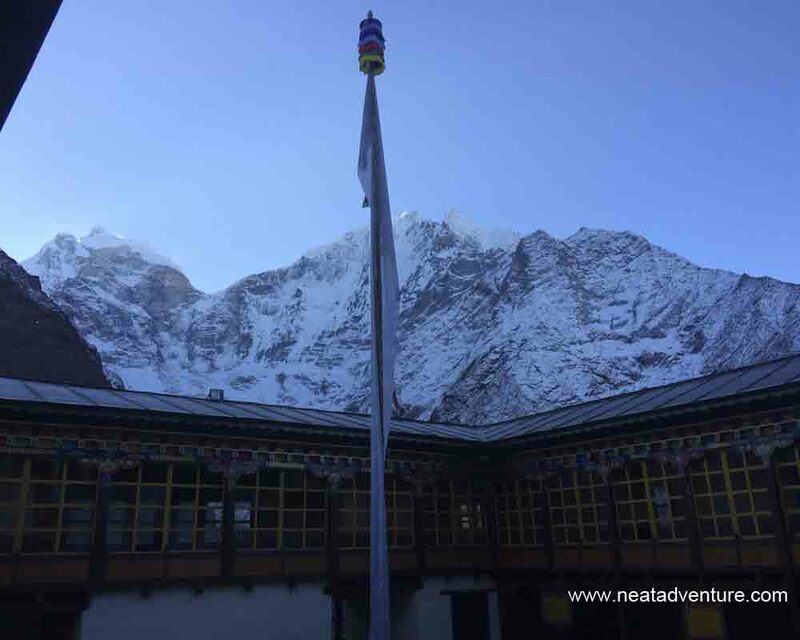 Tengboche to Pheriche - (4410m) 5 hrs walk To reach to Pheriche we need to descend through a beautiful forest and then after crossing Imja river, we will pass through the village of Pangboche. We will reach Pheriche known as the windy valley. Overnight at guest house including dinner and breakfast whereas lunch will be served in the tea house. Rest Day. (Optional climb to Nagarjun Danda(hill) or hike to Chhukung valley) - (4410m) Nagarjun is a hill located on the lands of the Chhukung valley directly above Dingboche. After breakfast we will head to Nagarjun. It may take about 5 hrs to reach Nagarjun. From Nagarjun we can see beautiful view of Lobuche east, Lobuche west, Lobuche peak, Thamserku, Kangtega and Amadablam. We could even see Makalu, the world’s fifth highest mountain. Then, we will descend back to Pheriche. Overnight at guest house on full board. Trek to Lobuche. (Optional of resting for one more day at Thukla for acclimatization) - (4910m) 5 hrs walk We have to trek along a broad valley floor to Dungla. Specially, Lobuche is a Yak pasture, with beautiful sceneries of mountains. Overnight at guest house inclusive of full board meals. 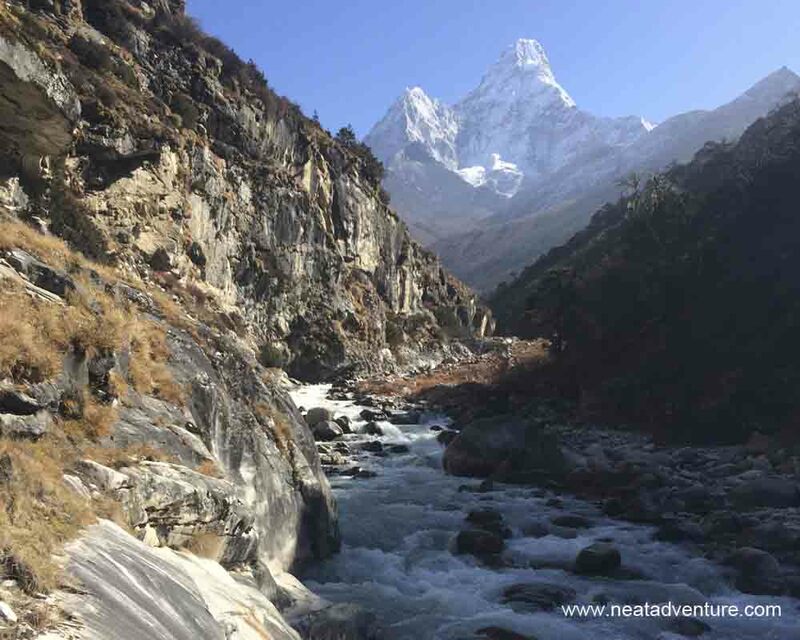 Trek to Everest Base Camp and back to Gorakshep for night - (5400m) 8 hrs walk We have to climb through meadows and moraine stones steps then reach to Gorakshep, either climb to kalapathar or continue heading to Everest base camp. We recommend you to go to Everest base camp after you arrive at Gorakshep. 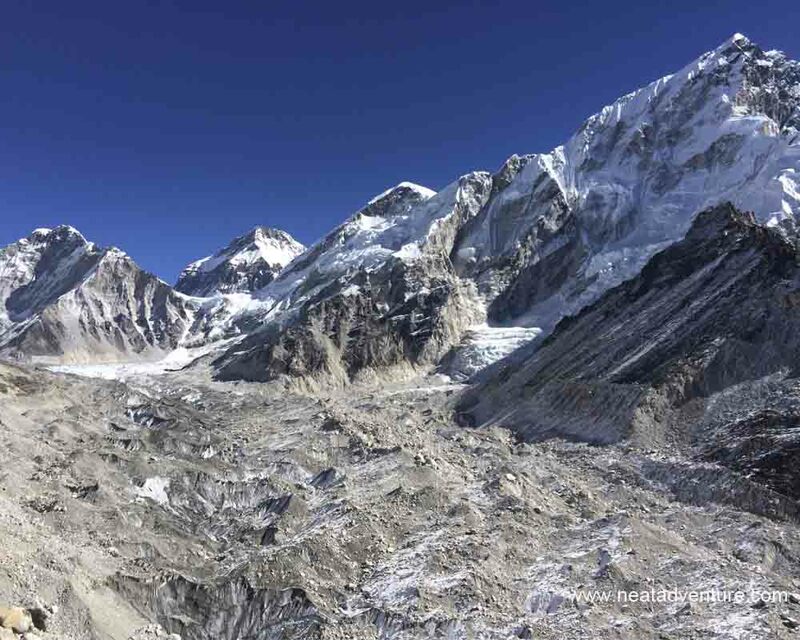 From Everest base camp you will not be able to see Mount Everest but you can have a good view of Khumbu Glacier and icefall. Base Camp is the beginning of Everest expeditions. Overnight at a guest house with fullboard meals. Trek to Pheriche. 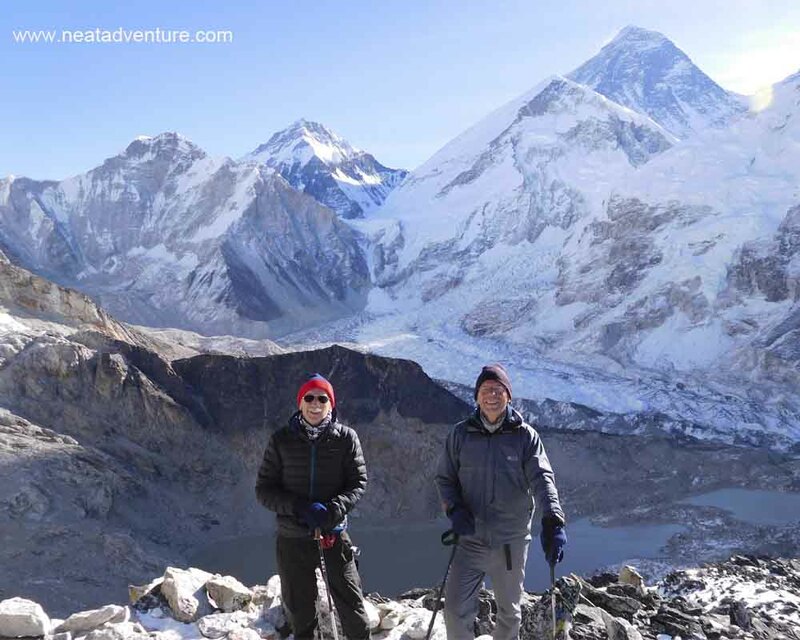 (Optional hike to Kalapathar 5550m for a majestic view of Everest ) - (4210m) 7 hrs walk Wake up early morning and have your breakfast and grab your pack lunch. After breakfast, hike to Kalapathar. From here, we can see the entire south face of Mt. Everest and peaks around & skyline of Tibet. The same day we will descend back to Pheriche. Overnight at guest house. Trek to Namche - (3440m) 6 hrs walk Trek back to Namche about 6 hours from Pheriche and accomodation at Namche with dinner and breakfast and lunch will be managed on the way. Trek to Lukla - (2800m) 7 hrs walk Trek continuously back to Lukla along the Dudh Koshi river about 7 hours from Namche, Lunch at Phakting and overnight at Lukla with dinner and breakfast. Flight back to Kathmandu. After having breakfast in the morning we will head towards Lukla airport for scenic flight about 35 minutes to Kathmandu and transfer to Hotel for overnight inclusive BB. Free Day At Kathmandu/Departure-This day, you can enjoy a free day at Kathmandu or depart for your home or other destination. It would be easy for you if you have your own group if not also we can arrange a group trek according to your request. You would be joining the group in Kathmandu. If you want to have a solo trip then we are always ready to help you again with single supplement charge. We try our best to make your comfortable holiday in the beauty of Everest region. Climate in Nepal is diversified depends on season. From the low level to highest point of the World, it starts from hot to cold region from South to North. You can travel Nepal in any season but the best time to visit in Everest region is autumn & spring. If you are in autumn the weather is perfect and sky is crystal clear but in spring the weather seem little cloudy but the full blossoming Rhododendrons are awesome. In Summer visibility is poor and there is less chances to see the himalayas and in winter it is very cold in mountain but still possible to do this trip. While you travel Everest Region, you need to obtain the entry permits and TIMS permit. All the applicable permits and entry fees are including on the given cost except personal contribution and donations. In case of extra charge and payment, the agency will inform you. NEAT is highly aware with Environmental concern and keep right ecological system. There shouldn’t be awful impact while you travel around the Everest region. So, we involve some campaign of cleaning trekking trails, works with KEEP project etc.